Kathleen comes to us from Tucson, Arizona, where she served the UU Church of Tucson as Director of Lifespan Faith Formation. Kathleen brings a contagious passion for nurturing people of all ages in their spiritual growth to her role, and has been serving Unitarian Universalism as a leader in religious education since 2001. Honesty, sharing feelings, and coming from a place of love are three of her core values as a religious professional, and her past leadership has focused on ministry with youth and young adults, multiculturalism and acceptance, volunteer support, and program administration. 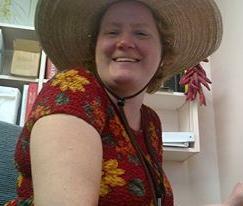 Prior to joining the RE staff at UU Tucson, Kathleen founded and ran her own daycare for over twenty years. She grew up in Tennessee and has also lived in Cleveland, Ohio.